I’m so excited to see and read all the information you and your family share with everyone! Of all the reading I have done I truly believe I understand what you guys teach the best! I actually had a visual of the hobbled poult! Thank you! I have enough moles to keep them from starving! Well, I suppose that’s one good thing to say about moles! Thanks for writing openly about this. I’m so busy and, sometimes, just want to give up my gardening time. It’s covered in weeds, but in reality it is highly productive right now. Bon, I think this is common to most people who both work and garden. Throw in family matters, and things truly do get complicated at times! Very good article, George. It sounds like you have experienced the sinking feeling of a garden being overtaken by weeds. (so have I.) I have had many very weedy and very productive gardens. Like kids it is very important to give the plants a good start. Once the plants have that start they can often compete and still yield with weeds that are overtaking the garden. My late summer plantings are often managed with a weed whacker between the rows instead of a hoe. It is much quicker and easier than hoeing. Fine seeded crops like carrots and beets are a lot of work no matter when you plant, but even they can be managed with a weed whacker once they have some size to them. Go between the rows and over the tops of them. It is ok to even shear them back a little. They will re-grow and it will give them a chance to get some more size. A 6 foot pigweed plant casts a lot of shade! If I can I try to keep them from getting that big. Sometimes I just snap them over while picking the crop. Every little bit helps! All great input John! One of my favorite weeding tools for mid to late summer is an Asian grass sickle. I use it like you use the weed whacker. It also makes me feel a little better when I cut armloads of weeds and use them to feed our meat rabbits and other livestock. As you said, “Every little bit helps!” Even getting the weeds cut goes a long way to making the garden more manageable. Sometimes having some weeds in the garden also helps to deter theft by camofluaging your crop. This is helpful especially if your garden is in a community garden where others may be tempted to steal. I got that particular one on Ebay for $6! Of course one needs to be sociable in order to have a wealth of relationships. We find we have developed a lot of friendships, in part, because of our lifestyle. A perfect example is that of the feed store. Our weekly visit there, is almost all on a first name basis. Additionally, probably the best way I know, to extend ones social engagement, is to have some skills and be readily willing to teach others. The darker bread, at top, is rye bread, which I just recently made. Soon, we will add that recipe to the course. Your bread sounds very interesting and I will look forward to seeing the recipe. Thank you! We’re training our LGD puppies and I’m so grateful to read this! We’ll be getting chicks in the spring. Something I didn’t bring into that post is the importance of ownership. The dogs truly seem to understand when something is “their master’s.” When they “get it,” then they will take care of it. So, when I’m teaching a pup about poultry, I make sure to hold a chicken and show it to him, telling him that “It’s mine.” Once he gets that in his head, most of the battle is won. Another thing which seems to be part of the well trained LGD psyche is the concept of eating what is GIVEN to them. Sure, they will scavenge for dead things, rodents, etc. But they learn that a lot of things are not okay to eat, unless “Master gives it to me.” That’s probably why Mando guarded that dead chicken all day, only eating it when I noticed him and told him that it was alright. Once upon a time I made my own laundry soap. I think I stopped when I was diagnosed with cancer. I need to start making it again. This one makes for fascinating reading. I think it might even be good for reading out loud as a family! So very true! Our dogs wouldn’t come in the house if we prepared them a steak!! That seems to be how it is with the majority of the livestock guardian breeds. They are REALLY cold hardy, getting really happy when it’s really cold! Where oh where is the catalog? Here’s a link which explains how to get a hard copy catalog. You can download a PDF version, right from their home page. Great article on Lamb’s Quarter, Emily. You have a flair for writing. It made me wish it were April already, so I could go gather some from our garden. Another good article Emily. Good read, we enjoyed it. Absolutely! We’d love to get it! Great idea Emily. Thanks for the gardening tip. That Brome Grass will die, if you fertilize it. If you can’t afford commercial fertilizr, try chicken litter or cow manure on it. Good to know! Thanks for putting this on here. Community makes this website better for all of us. I’m told that when the eggs are in the ice tray, you cover it with plastic wrap before freezing. Never done that and they are always fine. Once they are frozen, we put them in Ziplock freezer bags. Thank you! We will be continuing to add new courses and content over time, so check back often. We are so excited to be able to help people learn how to be more self sufficient. Thanks Austin! Do you have any gardening topics you’d like to see addressed? So true!! I often think of Yanna as my gentle giant. She has befriended a stray cat, but will run full force to a rabbit. She is a gentle giant, usually knowing what can be/should be nurtured, and what needs to be chased. She’s a good dog! I believe LGDs learn to recognize what their owner wants. They take their cue from you. She’ll probably care for that cat like one of her charges. Great post. Thank you for sharing. Love this post. Brings back a lot of sweet memories. Having a livestock guardian dog is such a wonderful thing. Love our dogs. Where do you store the starter if you’re not constantly using the starter? How often do you feed the starter? I store the starter in the refrigerator. There, it will be good for about 3 weeks. It will last slightly longer if you stir it occasionally. However, between making bread, English muffins and pancakes, however, I find that we use it every couple days. If you don’t refrigerate, you can keep in on the counter. This time of year, it will be good if you use and renew it about every other day. During warm weather it would need to be renewed every 24 hours. I have always been a little intimidated by the process of sourdough, yesterday I made the “no knead loaf”. I have been taking the course, and upon completion I had a much better understanding of starting the “starter”, keeping it going, and making a loaf of bread. Very much appreciate the simplicity of the instructions, takes the confusion out, and is taught on an entry level understanding. That’s so great to know. Thanks Angie! I will definitely be looking into purchasing your recommendation for the Bahco 4222. As far as a good reasonably priced pocket knife, what would you recommend? Well, there’s a wide range of taste in pocket knifes. For years I carried a Sodbuster Junior. The Sodbuster Jr is a good knife. Just beware, they’re coming up with a lot of customized variations which, though beautiful, will cost you a pretty penny. You should be able to get a simple version for about $25. Jerreth’s favorite is the Kershaw Clash, which is an assisted opening knife. It’s larger and more flashy than the Sodbuster Junior. Both have a single blade, which will work for most jobs, even cleaning fish. I’ve been carrying a Browning Congress Knife, which is actually a knock off of the Case Congress Knife, but much more economical. The Browning version is made in China. But I have been using one for several years now, and can attest to the good quality. It has four small blades. I use the two, which have a typical spear point, for skinning rabbits and paring vegetables, etc. I’ve cleaned a fish with it, but a larger blade is better. There’s a blade on it which is like a little box cutter. I find I use it a whole lot, for everything from opening packaged goods to cutting baling twine. Additionally, even in our current cultural environment, I could pull this knife out of my pocket almost anywhere without causing anyone to hyperventilate. It looks harmless (unlike the Clash). The main thing is to get a knife with some quality to the metal. Stay totally away from anything which has “Pakistan” stamped on the blade. I would also suggest that you avoid serrated blades. They cut really well, at first, but I don’t know anyone who hones them. So, when they get dull, they’re just dull. We’ll be doing a course on knifes sometime fairly soon, and in it we’ll deal with sharpening and maintenance, etc. When it comes time to ‘cut cracklins’ on hog butchering day, I’m sure we’ll put your new knife to the test. That’s probably the toughest job for a good knife that I know. If it will hold an edge through that, it ought to hold up to just about anything. I’ve got a set of Ken Onion skinning knives that my Son bought me a few years back. They’ve skinned several deer without so much as a touch-up. Those things amaze me how well they do their job. (I think I’d prefer your hunter orange grips while doing that job, than the thin steel grips my Ken Onions have.) They get pretty slick when they get wet. Not a good thing when you have a razor sharp knife in hand. Today, I’m living from the soil again. I’ve spent the last few hours thawing chicken that we butchered last Fall. While that is in the oven baking, I’ve wrapped a few sweet potatoes in foil to add alongside them. The sweet potatoes are some I have in storage from my Annual, Autumn Potato Dig. I think I’ll steam some broccoli as a side dish. Today, everything, including the Roselle tea, is from our farm. That’s a really good feeling. I love those days when just about everything comes from the fruit of our own land! I’m going to have to see these Ken Onion knifes. Thank you for the information, seems I’m always needing one in my pocket and what I have is to large for that. I will be investing in both knives, hopefully before to long. Well written, and wonderful philosophy, Emily. I think I need one for my pocket, one for my purse, one for my truck, one tucked into the old mail box that holds lawn tools, then I’ll be set! Thanks for the little history lesson, I’ve had a few family members that would whittle during down time. I agree with George. I carry a pocket knife where ever I go. For most of my life, I was an Electrician, so I used a pocket knife nearly every day at work. 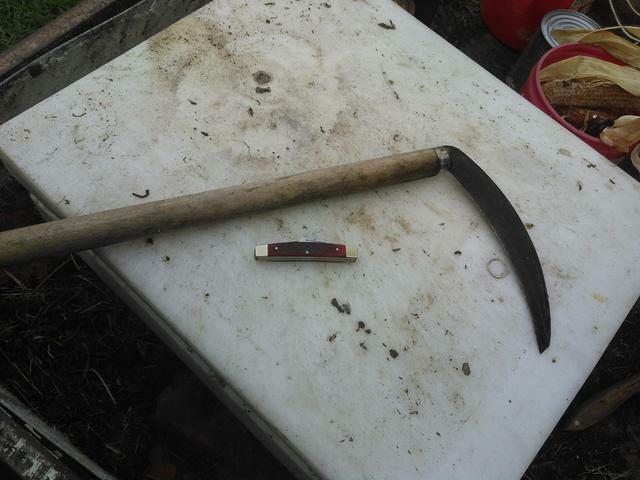 This is an invaluable tool for a homesteader or anyone else for that matter. (Seriously, a pocket knife could save your life someday). I’ve had occasion, to use mine to cut a horse loose that went down in a stock trailer with a saddle on. The saddle horn was hung up in the bottom rail of the gate and the cinch was cutting off the horse’s air. I had to cut the leather cinch to get the horse back up, so she could breathe again. Early settlers probably faced challenges similar to that one in everyday life. If you are ever in a situation and need to cut a rope, quick, or nowadays, maybe, cut a seatbelt, or open a heavy duty cardboard box, a pocket knife is an essential tool to have on hand at all times. Angie, I like your way of thinking! Ron, Jerreth had a similar experience, when we were first married. She was working at a youth camp as a wrangler. Someone donated a horse to the camp and she was checking it out. It went beserk and literally hung itself by the lead rope. There were at least 30 people present and not one had a knife on them. She wrecked her back, holding that horse up (so as no to choke the rest of the way) until someone could run and bring the only tool they could find, a set of old hedge trimmers! They saved horse, but my wife’s back has never been the same. After that, she has always carried a knife. Her preference is an assisted opening Kershaw. I suspect part of the reason she prefers it is that she remembers having to hold the front end of a horse and try to cut a rope with hedge trimmers. She wants a knife she can open with one hand, while holding the horse! We stretch our chicken, by boiling the carcass down, after everyone has eaten what they will of the initial roasted meat. It only takes about two hours to boil the meat off the bones and this also produces a good broth from the bones and cartilage. Once the meat is boiled off the bones, I pick everything out of the broth, using a pair of tongs. Then, I pick out the tender meat and place it back into the broth. I then add a couple hands full of egg noodles and boil them until they are tender. While the noodles are boiling, I bake a pan of homemade biscuits and we enjoy our fresh chicken soup. Sounds delicious Ron! Biscuits or dumplings really highlight a good soup! That was some really sage advice about not loaning a chainsaw any sooner than you would loan your only toothbrush. Not to mention very good advice about not buying a “cheapo” chainsaw from a big box store. I have the same model chainsaw as the one pictured in your article. A Stihl MS-250. It has lasted through about 85 ricks of oak and hickory wood so far, with no need for any parts other than an air filter and a spark plug. You can’t beat a Stihl chainsaw. I didn’t think that before I worked in Washington State for two years, talking to real loggers about real saws. I lived in the Cascade Mountains, near Issaquah and Snoqualmie. There was a logging truck on our backwoods road about one truck every two minutes. Loggers up there swear by the Stihl brand. When I came home, I ditched my Poulan and my Husqvarna. From now on, I only buy Stihl. No Poulan would ever come close to lasting through 85 ricks of Cherokee County, hardwood and flint rocks. (Speaking of flint rocks, I’ve even seen a tree with a rock inside it). A sapling with a twin growing beside it can pick up any debris that happens to be laying between the two as they grow taller and closer together.) I once cut a tree that had an old, antique, 10-2-4 Dr. Pepper bottle inside it. Not to mention all the times I’ve cut into barbed wire, hog wire, nails, lag bolts, dog chains, or screws inside a tree. The nails, screws, dog chains, lag bolts, and things like that, mostly happen near houses or in town; often when people with good intentions give you “free” wood, and all you gotta do is come and cut it. When you arrive on a job like that, you’ve got to stop and think, “Who knows what kid might have had a tree house up there 20 or 30 years ago?” The barbed wire or hog wire can happen anywhere there has ever been a homestead in years past. You never know what you might find inside an old tree. Great advice Ron! The first tree I ever cut down on my own was a really large honey locust. I didn’t know much, so when the chainsaw started throwing sparks, I just kept working away at it, destroying my chain. I had to leave that tree standing, as it just wasn’t possible to cut it down. A week or two later we had 30 mph winds at night and we heard it fall. I went over there in the morning and discovered a PLOW SHOE in the middle of that tree! Makes excellent handles for axes and picks. I bet it does. I haven’t seen documentation on it, but I bet black locust boards would work wonderfully for making things which will be in contact with the soil, like boards for raised beds. They wouldn’t rot, yet they wouldn’t contaminate food crops grown in the beds they contain. We got into livestock guardian dogs because we were up every night fending off the coyotes and were losing livestock. Another awesome article, Emily. I always enjoy reading your work. Thank you, for the helpful insights you bring us. Thank you! I’m glad you enjoyed it. I want from you, sign me up for the newsletter!